Once I had the tea bag on the spoon, I would wind the string around the tea bag to squeeze out the last bit of tea water. Then I would drink away, pretending I was a tea connoisseur. Now I know not all teas are created equal. And brewing them is more than tea bag, boiling water, squeeze, drink. 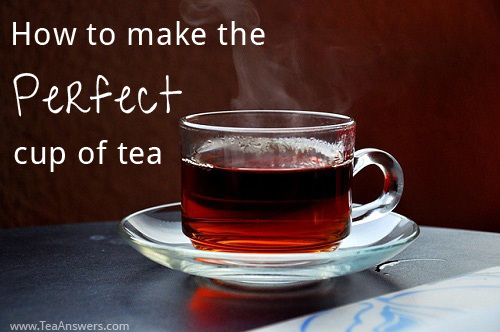 It is possible to make the perfect cup of tea if you follow a few simple steps. Here are some tips to help you make the perfect cup of tea – green or black. Tip 1: Don’t follow the directions on the package your green tea came in unless it states to brew it for no more than 1 minute. Some green teas, like genmaicha (green tea with roasted rice), should only be brewed for 30 seconds. This goes pretty much as fast as: pour the hot water into the teapot, sit down the kettle, and drain the tea into a cup. Tip 2: Don’t use boiling hot, hot, hot water. It will make your green tea taste bitter, sharp, and just plain yucky. Watch the water as it heats. When you see steam vapors, what I like to call “water smoke,” beginning to spiral up from the water, the water is hot enough to make green tea. Tip 1: Don’t let the black tea brew for less than 2-3 minutes or more than 5 minutes. This amount of time will bring out a nice caramel color and the flavor of the black tea, but not the bitter tannins. My friend, Diane, loves her black tea really strong. She’ll let it brew for 10 or more minutes. She sometimes adds milk and sugar, but mostly she likes it plain with the brewed tea as black as the tea leaves. She adores the really strong bitterness that happens when tea is brewed too long. In the UK, strongly brewed tea with milk and sugar is known as workman’s or builder’s tea. For me, that’s too strong not only for the taste of the tea but even how it looks. And since we drink with our eyes first, I want my tea to look good. Tip 2: Don’t use boiling hot, hot, hot water. Just like with green tea, black tea suffers from too hot water. Boiling water boils the tea leaves creating more tannins and more bitterness. Watch the water as it heats. When you see bubbles starting to form on the bottom, the water is hot enough to make black tea. Tip 3: Don’t be fooled that loose leaf black tea is too much work. A teaspoon for each cup and another for the pot and you’re done. You can use a strainer to contain the tea or let the tea move freely in the pot. Either way works, but I prefer the “move freely in the pot” method. A strainer may keep the tea leaves from opening and you’ll lose some of that great tea taste. Ultimately, making the perfect cup of tea is about how you like your tea. But, if you follow the simple tips above, you may be surprised at how easy it is to make the perfect cup of tea…and how great it can taste.